We’ve done a lot of work on our business products to make it easy to create workspaces. Whether you use one of our built-in workspace templates, a template from the Template Store, or your own custom templates, you can create a customized workspace in less than a minute. The process is even faster with our Salesforce.com connector, which allows you to create a custom workspace, including data from Salesforce.com, without ever leaving that application. All this hard work has generated the intended result–our business customers are creating hundreds of workspaces per network. And once you have hundreds of workspaces, you need a better way to organize them, which allows you to group related workspaces and reflect how you run your business. For example, Anderson DDB Health & Lifestyle creates hundreds of workspaces per year, just to manage the projects of one major client. Network Folders let them reflect that client’s organization (35 business units, 5 geographies) within PBworks. Learn more about working with Network Folders. We’ve also made major improvements to the way we handle files and documents. In PBworks, wiki pages provide a lot of functionality beyond simple viewing and editing. 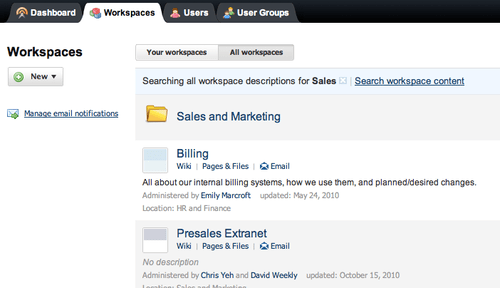 You can comment on a page, providing another way to collaborate outside the main page content. You can tag a page, making it easier to find when you search for it. You can even set custom security settings on a per-page basis. Now we’ve brought that same level of collaboration to files and documents. While you can still simply focus on uploading, downloading, and sharing files, you can now comment, tag, or secure individual files, just like you can with individual wiki pages. This can be especially helpful if you’re gathering feedback on a file, either internally or from a client. Now you can upload that new logo design, share it with your client, and get notified when that client provides his or her comments. Learn more about working with files. Both Network Folders and the improved file collaboration are available on our paid business products.